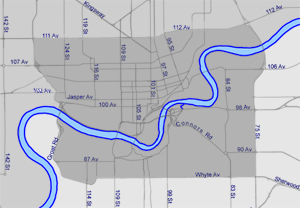 Find out what's happening on Edmonton's roads. For infomation about road closures, detours and tavel delays visit the online Roads & Traffic Updates calendar. This service is available 24 hours a day, 7 days a week. What are the boundaries for North, South and Central areas? East/west - 75 St. to Groat Rd. North/South - 112 Ave. to 82 Ave.
Really Simple Syndication (RSS) provides an information feed that can be used to track new and updated events on the Roads & Traffic Updates calendar without having to visit the web page. Use your web browser (i.e. Internet Explorer/MozillaFirefox) or a feed reader to view RSS feeds. Customize RSS feeds from the Roads and Traffic Updates calendar by selecting category filters and clicking the RSS button.